with YO. MONOUCHI may be held quiet and then expanded to pattern. patterns, but KUNIMUNE will lack MORIIYE's HA-HADA. MITSUTADA, rise in tall stands from a KO-CHOJI ground. alternating stands that march to the lower. IKUBI-KISSAKI that may appear somewhat stout after KEN-CHO 1249. KUNIMUNE(2). Also: SHIRAKE Steel is his noted special color. Steel   Early: Tight KO-MOKUME with CHIKEI appearing. Later: KO-MOKUME has O-HADA and MIDARE-UTSURI. round TOBI-YAKI of different size dot along the HABUCHI. KO-NIE and particularly notable NIOI-FUKASHI. Early: KAWAZU from KO-CHOJI with TOBI-YAKI dotting. Later: GUNOME joins together in an uneven, mountainous CHU-width. BOSHI - MIDARE-KOMI BOSHI to small KO-MARU. rain. All five have sharp ends that point to the pole. Large SHINOGI-TSUKURI, IHORI-MUNE, CHU-IKUBI KOSHIZORI TACHI. Strong KO-ITAME KITAE stands with flowery MIDARE-UTSURI. Typical late work exhibiting Ko-Mokume Hada with Ji-Nie and Midare-Utsuri. Chu-Sugu ko-Choji-Midare Ba that undulates in height. Of Nioi-Fukashi and Ashi and Yo. Figures are a little Shirozomo whitish here and there. 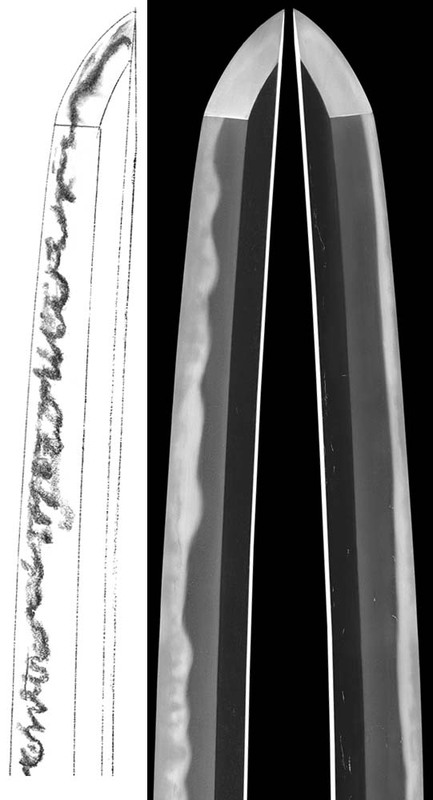 Shinogi-Tsukuri, Ihori-Mune, deeply curved Koshizori to Ikubi-Kissaki. Itame Hada has Mokume in the mid with Ji-Nie and Midare-Utsuri. Choji-Midare Ba of Nioi-Fukashi, Ashi and Yo, seats generally wide. Sunagashi and Hotsure create Tobi in the Habuchi. The Monouchi restrains to Chu-width with Sunagashi and Shimaba dotting above. Shirozomo is seen. Suriage Nakago has two Mekugi-ana. The Jiri cuts across a lower Ana. 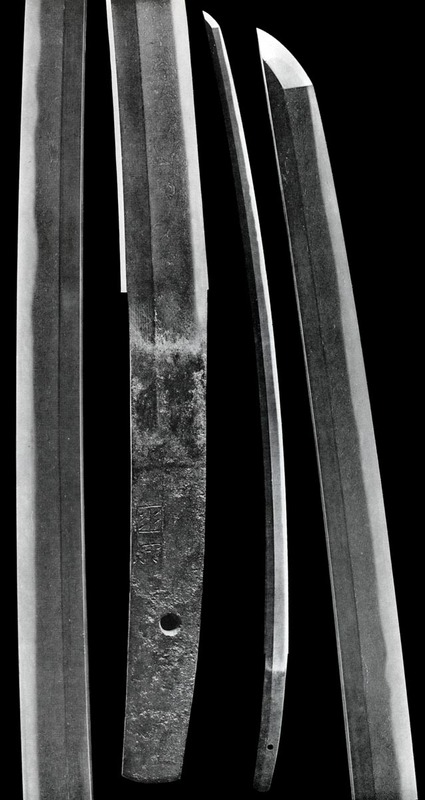 Shinogi-Tsukuri, Ihori-Mune, wide Ji, deeply curved to Chu-Kissaki. Strong example of early Kunimune. Ko-Mokume has Ji-Nie and Chikei. Midare-Utsuri through the mid. Gunome Choji-Midare of Ashi and Yo where Sunagashi streams through figures. Notare-Komi with Hakikake and KoMaru Kaeri. O-Suriage Mumei Nakago has four Mekugi-ana, three are filled. defined NIOI KO-CHOJI with KO-ASHI. Slight HA-HADA. slurred as compared with KUNIMUNE(1), and may be long. KUNIZANE(2) SHO-GEN (br: KUNIMUNE, f: KUNIZANE 1): BIZEN TARO. JI-NIE. Patterns of CHOJI-MIDARE KO-MIDARE BA. See KO-BIZEN NAOMUNE for KUNIMUNE family origins. to SAGAMI. NIE KO-MIDARE TOGARI BA runs smoothy. KUNITSUNE TOKU-JI (f: KUNITSUNA): Work from SHO-GEN 1259. MOKUME. MASAMUNE BUN-EI (t: KUNIMUNE): From JO-EI 1232 to SHO-O 1288. YOSHITSUNA SHO-GEN (t: KUNITSUGU): MOKUME shows NIE JI-BA. KUNIYOSHI KEN-GEN (f: KUNIMUNE): MOKUME. KO-MIDARE CHOJI BA. KUNISHIGE BUN-EI (t: KUNIMUNE): CHOJI-MIDARE BA. MASAZANE KA-GEN (t: KUNIMUNE): CHOJI-MIDARE BA. 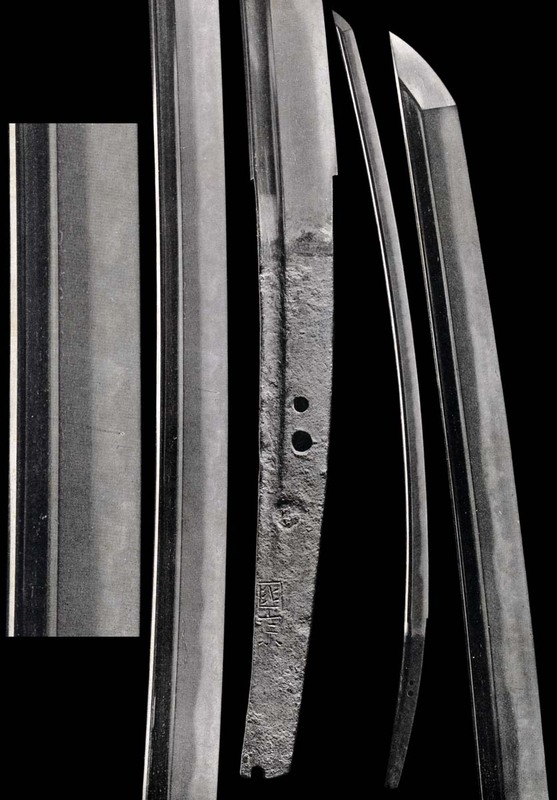 Shinogi-tsukuri, Ihori-mune, Narrow Tachi Sugata with raised Shinogi-taka. Shinogi-Ji is narrow. Said the student of Nagamitsu, it has an unrushed maturity. A running and knit Mokume Hada has JiNie. Evenly set Sugu hamon line holds Coji and Ko-Choji-Midare Ba. Suriage Nakago has three Ana, the lower a key-way. 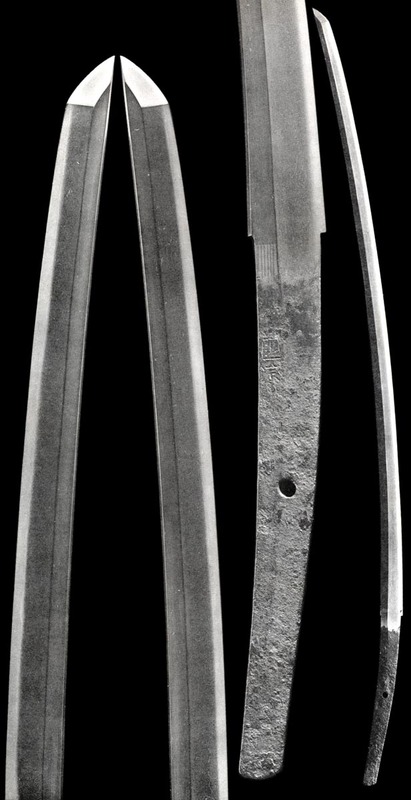 Old style Shinogi-Tsukuri, Ihori-Mune, deeply curve to Ikubi-Kissaki. Mokume Hada with Ji-Nie and standing Midare-Utsuri. Asaki-Notare Chu-Sugu of Ko-Midare Ba has leaning Saka KoAshi. Hoso-Sugu Boshi in tight Nioi. Ubu Haagari Kurijiri Nakago has one Mekugi-ana. Signed in the upper Ji.